Slade Wilson's army of Mirakuru-enhanced convicts have been turned loose upon Starling City. A cure is on the way, but the courier delivering it has become trapped in the chaos. And even with Quentin Lance placed in charge of the police department and The Canary back in town, it is hard to see how Oliver Queen and the rest of Team Arrow might save the city. Meanwhile, Thea Queen is saved by a most unlikely ally - Malcolm Merlyn, who is alive and well and seeking to reconcile with his daughter. In the flashback, Oliver plots how to board the Amazo, rescue Sara and recover Ivo's cure so he can save Slade. Green Arrow Year One (The flashback sequences), Green Arrow: Heading Into The Light (Green Arrow and his allies fighting a running battle as supervillains destroy his city) and many Judd Winick stories which attempted to set Deathstroke up as an arch-enemy for Oliver Queen. How did Ollie get separated from his quiver and bow after triggering the cave-in? Wouldn't it make more sense for Diggle to carry the injured Felicity and for Ollie to carry his own bow, as they make their escape after their van is flipped by Slade's men? Every member of the cast is given one moment to shine and most of them get at least one good speech. The exceptions to this are David Ramsey as John Diggle (who isn't much for speeches) and Summer Glau as Isabel Rochev/Ravager (whose speech gets cut short - see Dialogue Triumphs below). There is a reoccurring theme in the direction and cinematography, with close-ups on Oliver's hands and how he reacts to displays of physical affection, from how his offer of a handshake to Anatoly is turned into a hug to his slowly hugging Felicity back when she offers him a hug along with her words of encouragement. This episode shares its name with a Bruce Springsteen song. The song is told from the viewpoint of a man - a self-described loser who feels alone and hopeless, which is a fair assessment of Ollie's mindset through much of this episode. The penultimate episode of Arrow's first season - 122 - also took its name from a Bruce Springsteen song - Darkness On The Edge of Town. Both this song and Streets of Fire were on the same 1978 album, which was also named Darkness On The Edge Of Town. The episode also shares a name with the 1984 cult-classic film Streets of Fire. There's seemingly no connection between the two, save that the movie was named also named after the Bruce Springsteen song and was meant to use the song on its soundtrack. Sadly, The Boss denied permission when he found out the studio planned to have another artist cover the song. As in 221, this episode does not begin with the standard "My name is Oliver Queen" introduction. Oliver's current bow is a compound bow. Curiously, Oliver Queen in the comics preferred recurve or long bows over compounds. One of the addresses Quentin directs his men towards is the corner of 5th and Adams. This is a reference to legendary Green Arrow artist Neal Adams, who designed Oliver Queen's Robin Hood costume. Quentin Lance's radio call-sign is Delta Charlie 52. Or DC 52. As in DC Comics and 52, which is a number of some significance in the DC Comics universe. Oliver's explosive arrows have metallic heads that are larger than a standard-size arrowhead. Felicity: Huh. I really thought the airbags were going to go off. Ollie: I meant what I said. If we're not back in an hour, you sink the freighter and get yourself home. Anatoly Knyazev: I think maybe I prefer Bahamas. Quentin Lane: Well...There's only one more guy we can call. You're not going to like it. Quentin Lance: (shakes his head) The Arrow. (pauses) Lieutenant... I know it's breaking the law. But what we're up against isn't about The Law. It's about survival. We've got masks tearing our city to pieces and we're going to need a mask to stop them. Lt. Pike: ... make the call. Slade Wilson: They say Nero sang as he watched Rome burn. Now I understand why. Sebastian Blood: What the hell is going on? One of your juiced-up jack-boots just killed my entire office staff! And snapped the District Attorney's neck! Laurel: Sara? Where have you been? Laurel: Why did you come back? Sara: I don't know. There isn't anything here for me. Laurel: Your family is here. Sara: You don't know, Laurel. About me. About who I am and who I've become. Laurel: I know you're a hero. Sara: I'm not a hero, Laurel. I'm the furthest thing from it. I am Ta-er al-Asfer. That was my new name. Because the woman that I was... the girl that I was... is gone. Laurel: I'm not going to pretend that I've been through anything that you have. One thing that I've learned in the past year is that these things... they don't break us. They make us who we are. Sara: What I am... is irredeemable. Laurel: What was that word you said before? Laurel: What does that mean? Sara: It means "The Canary"
Laurel: If you're so far gone... and so irredeemable... then why would they know you by such a beautiful name? Felicity: What's happening now isn't your fault. Ollie: Yes it is. I have failed this city. Yao Fei. Shado. Tommy. My father. My Mother. All that I have ever wanted to do is honor those people. Felicity: You honor the dead by fighting. And you are not done fighting! Malcolm Merlyn? The Count? The Clock King? The Triad? Everyone who was trying to hurt this city, you stopped them! And you will stop Slade! Ollie: I don't know how. Felicity: Neither do I. But I do know two things. You are not alone. And I believe in you. Sebastian Blood: As a young boy, I was plagued by nightmares. Every night I would wake up in a cold sweat, frightened and alone. It was my father's face that haunted me. (holds up his skull mask) And this is how I saw him. The embodiment of desperation and despair. I made this mask to conquer my fears. And to remind myself why I fight. Every day. To give this city's most desperate a chance. Sebastian Blood: I hope you can beat him with this. For all of our sakes. And when this is over, I promise you... I will do everything in my power to rebuild Starling City. And I won't just make it the way it was. I will make it better. Like I always planned. Ollie: You really think... after everything that's happened... after what you've done... that they'll still let you be mayor?! Sebastian Blood: Why not? No one knows that I've done anything except try to save this city. And if you tell anyone about my mask, I will tell them about yours. Ollie: Do what you have to, Sebastian. Malcolm: If you're going to use that, you'll want to click the safety off. Thea: I'll shoot you. I will! People enhanced by Mirakuru can withstand the force of a car hitting them with no ill-effect. However, three grenades or one of Oliver's explosive arrows is enough to kill them. They are strong enough that they can easily push/slide a parked car. Slade has at least 50 men working under him. Anatoly Knyazev affirms his friendship with Oliver and promises him anything should they survive this - an offer Ollie took advantage of most recently in 206. He also promises to teach Oliver Russian, which we've known Ollie could speak since the Pilot. Quentin Lance is promoted to Detective once again. 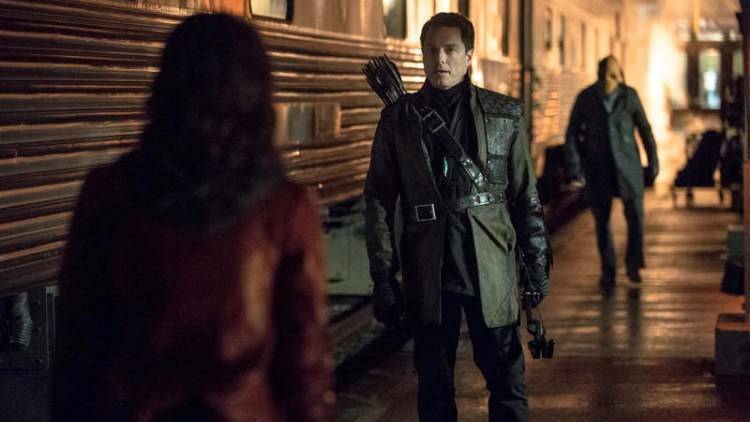 Malcolm Merlyn is seen for the first time since 208. His reason for coming to Starling City has nothing to do with the current chaos and everything to do with him wanting to speak to his daughter now that Moira Queen is dead. D.A. Kate Spencer - last seen in 219 - is killed by Slade's men. Sara once again refers to her name in the League of Assassins - Ta-er al-Asfer a.k.a. The Canary - which was first mentioned in 205. Blood is killed by Isabel Rochev at the episode's end. Much of Season Two's idea of Deathstroke being set up as The Arrow's greatest enemy can be traced back to the Green Arrow comics of Judd Winick. It is worth noting that, unlike Winick, the writing team of Arrow took care to establish a history between the two characters and craft reasonable motivations for Slade to have a grudge against Ollie beyond "I'm a villain. You're a hero. We must kung fu fight!" A solid hour of action that doesn't let up for a moment, with not one but three cliffhangers! The season finale can't come fast enough!